Don't let odors build up in your high efficiency (HE) washer when there is an easy solution. 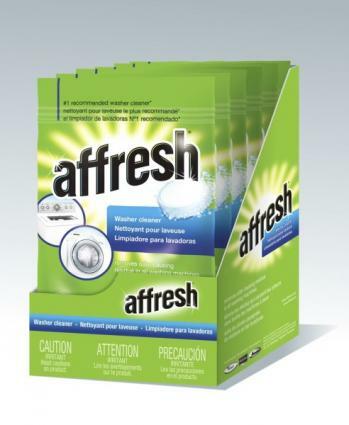 Affresh Washer Cleaner is simple to use and will have your washer smelling as good as new. As a member of Love To Know's writing and editorial team, I was sent a sample of the Affresh products to test and review. 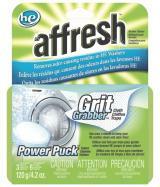 Affresh Washer Cleaner removes residue that can cause odor. It is made for HE washers and comes in a convenient power puck. I received the Washer Cleaner Kit. Included in the kit are three power pucks and six Grit Grabber cloths. The Grit Grabber cloths are designed to trap dirt that can form around a washer's rubber seal. The power pucks are used inside the washer and dissolve to remove and prevent residue from forming that can cause bacteria. The bacteria is what leads to the odor. One problem that many experience with HE washers is odor not only in the washer itself but on clothes that have been washed. To eliminate this problem, Affresh has created products that are simple to use and effective in eliminating odor at the source. These products are created to clean and leave your washer smelling clean and fresh. I find out if they really do all that they claim by testing them out firsthand. It is recommended that the washer cleaner be used monthly. The power pucks and cloths are packaged individually and come in a convenient re-closable container that makes for easy storage. The washer I used it in is a front-load HE washer. To get started, all that is needed is to open the package and place the power puck into the washer itself, not into the detergent tray. The washer should be empty and free of clothes. I set my washer on the hottest setting and allowed it run for a full wash cycle. If you washer has a strong odor, Affresh recommends running it for three wash cycles. I only ran it for one cycle and immediately saw a difference. When I opened the door to my washer, I smelled a fresh scent and the interior of my washer was sparkling and clean. Another bonus of the Affresh Washer Cleaner is that it is environmentally friendly. For those with septic tanks, it is safe to use and will not cause a problem with your system. I also used one of the Grit Grabber cloths and was shocked to see the amount of debris it removed from my washer's rubber seal. I did not see any debris built up on the ring until I ran the cloth around it. The cloth is disposable so after use, I simply tossed it away. Couldn't be easier. If you're interested in trying out the Affresh Washer Cleaner, it is available from many retail stores such as Sears, Lowes and Best Buy and from online retailers such as Whirlpool.com, Maytag.com and Amana.com. The suggested retail price for the cleaner is $6.99 and the kit is priced at $15.99. Many retailers may run sales so check often to find the best deals on these great products that will leave your washer and laundry smelling fresh and clean.